Briarwood Playground is named for the Queens neighborhood in which it is located. Bounded by Union Turnpike, Parsons Boulevard, Hillside Avenue, and the Van Wyck Expressway, Briarwood was developed by Herbert A. O’Brien in 1905. O’Brien was the owner of the Briarwood Land Company, which got its name through the suggestion of O’Brien’s wife, Adeline, who noted the woods and briars, prickly plants or shrubs such as the round leaf greenbrier (Smilax rotundifolia), that covered the area. The enterprise was initially unsuccessful, however, and the land was not fully developed until the 1920s, when the lots formerly owned by the company were sold at auction. In 1947 the United Nations (UN), in conjunction with the New York Life Insurance Company, built Parkway village in Briarwood to serve as a home for the organization’s employees. The development was converted into a co-op in 1983, and remains a diverse community, though few of its residents work for the UN. Today Briarwood contains single-family homes, as well as multi-story apartment buildings, built on the neighborhood’s winding streets. Before being named after the neighborhood of Briarwood, this site was known as Van Wyck Playground. Robert A. Van Wyck (1849-1918) was born in New York City and graduated from Columbia Law School in 1889. In 1897, Van Wyck became the first mayor of Greater New York after the consolidation of the five boroughs in 1898. During his term in office, Van Wyck renamed Western Boulevard north of Columbus Circle “Broadway” in 1899, extending one of Manhattan’s most famous streets. On March 24, 1900, Mayor Van Wyck began another New York institution by breaking ground in front of City Hall for the city’s first subway. An expressway bearing Van Wyck’s name was built to connect John F. Kennedy, then Idlewild, Airport to several of the main east-west thoroughfares that run through Queens. Initial construction of the Van Wyck Expressway (I-678) was completed in 1950, and the road was officially opened on October 14 of that year. The construction of the Van Wyck Expressway required the impressive engineering feat of elevating the Long Island Rail Road switching yards and terminal in Jamaica, Queens (at 1,100 trains a day one of the busiest railroad junctions in the world), up into the air to allow for construction of the roadway underneath. The playground opened on August 27, 1957, adjacent to J.H.S. 217, Robert A. Van Wyck Junior High School. Parks and the Board of Education have jointly operated the park since November 1954. The park opened as J.H.S. 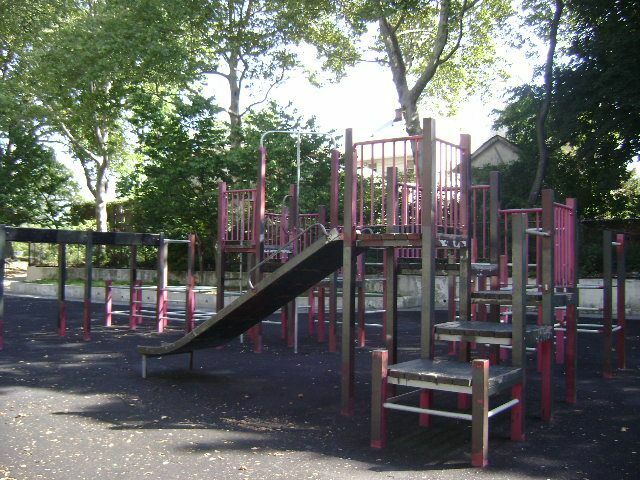 217 Playground and was changed to Van Wyck Playground by Commissioner Stern in 1985 and then renamed Briarwood Playground by the Commissioner in 1997. Today the playground contains play equipment, benches, and an octagonal seating area to be enjoyed by residents of Briarwood and the surrounding communities.